← Cosplay Pictures for Your Saturday Fun! Why pilot a plane with your hands and feet when you can do it with your brain? Thought-controlled flight could be arriving soon, according to the EU-funded “BrainFlight” project. A team of scientists from the Institute for Flight System Dynamics and the Berlin Institute of Technology says it has translated brain impulses into control commands, enabling pilots in a plane simulator to achieve a range of remarkably precise maneuvers without touching the controls or pedals. Wearing a cap with lots of cables attached, pilots in the simulator were able to land a plane simply by looking at the screen and moving the control stick with their thoughts, correcting the plane’s position repeatedly until it landed. 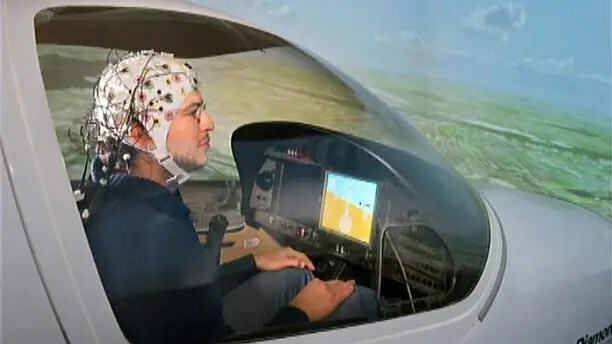 To achieve the breakthrough, the researchers connected electroencephalography (EEG) electrodes to a cap to measure the pilot’s brain waves. An algorithm created by Berlin Institute of Technology scientists enabled a program to decipher the brain waves and convert them into commands fed into the plane’s control system. Once it’s perfected, brain-controlled flight could reduce pilot workload and increase safety. Freeing up pilots’ hands would give them freedom of movement to manage other manual tasks in the cockpit. The German team conducted its experiment using seven test subjects with a range of flight experience, including one who had no experience whatsoever. The team reported that all seven, flying the plane only with their thoughts, managed to achieve accuracy that would meet some flying license requirements. Astonishingly, even the participants with little or no prior training succeeded in landing the planes. One participant was able to follow eight out of 10 target headings with only an incredibly small 10-degree deviation. Another was able to land within only a few meters of the runway’s center line. Some even managed their approach in poor visibility conditions. Imagine what trained military pilots might be able to do with this technology. In 2010, British researchers revealed that fighter pilots, despite being more sensitive to irrelevant and distracting information, have significantly greater accuracy on cognitive tasks. When scientists looked at MRI scans, they found that pilots have a white matter microstructure in the right hemisphere of their brains that is different from non-pilots’. The German team’s achievement isn’t the first of its kind. Last year, a team from the University of Minnesota announced that it had flown a model helicopter through an obstacle course using thought alone. As in the German system, electrodes were attached to the pilot’s scalp, and his brain waves were used to guide the aircraft. Creating a mental image altered brain activity in the motor cortex, which was recorded by the electrodes. A computer program deciphered the signals and translated the pilot’s intent. To move the helicopter in a particular direction, a user imagined clenching his or her hands. To go left, for example, the pilot pictured clenching the left hand. To go up, he clenched both hands. Ultimately, the developers of the mind-controlled helicopter hope to adapt their technology to direct artificial limbs and other medical devices. In another example, in 2010, a team at the University of Illinois at Urbana-Champaign announced it had flown an unmanned aircraft at a fixed altitude with the ability to adjust headings in response to the pilot’s thoughts. The TU München scientists are now researching how control systems and flight dynamics must be altered to accommodate brain control. For example, pilots flying with their hands feel resistance in steering. But this sort of feedback doesn’t happen in brain-controlled flying. The next step is to find ways to provide this sort of critical feedback without physical contact.